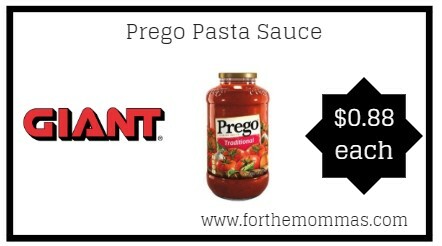 Giant: Prego Pasta Sauce JUST $0.88 Thru 1/24! Thru 1/24, Giant shoppers can score Prego Pasta Sauce for ONLY $1.88 each. Plus, there is a Giant digital coupon available to stack with this deal to make the final price $0.88 each.